Nintendo Switch - 32GB Gray Console - (with Gray Joy-Cons). Condition is New. Shipped with USPS Priority Mail. Nintendo Switch 32GB Gray Console w/ Neon Red & Blue Joy-Cons Tested WORKS! System was tested and works great! Unit was factory reset and is ready for setup. 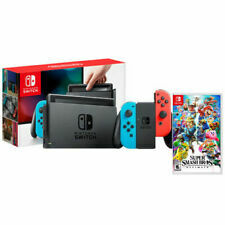 Nintendo Switch 32GB Gray Console with Neon Blue & Red Joy-Con. Other joycons work great, just the red works when connected only. 5 out of 5 stars - Nintendo Switch 32GB Gray Console w/ Neon Red & Blue Joy-Cons Tested WORKS! 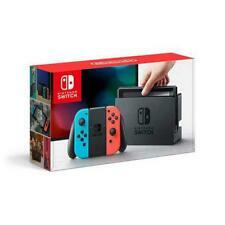 1,487 product ratings1,487 product ratings - Nintendo Switch 32GB Gray Console w/ Neon Red & Blue Joy-Cons Tested WORKS! 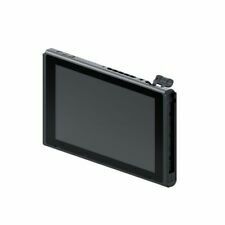 Nintendo switch 32gb tablet with accessories! I am older and thought I would use it more than I do. I haven't put any of the glass screen protectors on I just got them and just never bothered. The case I just got and is like new. All I got with it was a charging cable and I used the samsung adapter and it worked fine. MODEL HAC-001. HERE IS WHAT IS INCLUDED IN THIS BUNDLE. 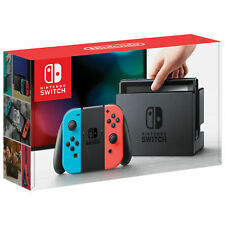 Nintendo Switch 32GB Gray Console with Neon Red and Neon Blue Joy-Con. Condition is New. Shipped with USPS Priority Mail. Never opened Nintendo Switch New. Condition is New. Shipped with USPS Priority Mail. Nintendo Switch - 32GB Gray Console - (with Gray Joy-Cons). Condition is Used. Shipped with USPS Priority Mail. Has had screensaver installed since it was originally removed from packaging. Played mostly in the docked position. Some very minor wear on the joy con grip but nothing that I could get to photograph. All original equipment included. 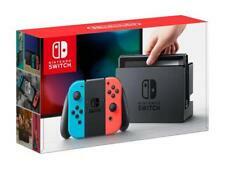 Nintendo Switch 32GB Gray Console with Neon Red and Neon Blue Joy-Con. Shipped with USPS Priority Mail. This is new sealed product. I'm sorry about your inconvenience. Nintendo Switch - 32GB Gray Console - (with Gray Joy-Cons) Skyrim Included. TV dock, controller & power cord included. Condition is Used. Looks like new. Hardly used. Shipped via UPS. Super Smash Bros Ultimate. - Nintendo Switch console. - Docking station for console. The switch is running the latest firmware and is in mint condition. Can get space grey joycons or red/blue neon joycons. 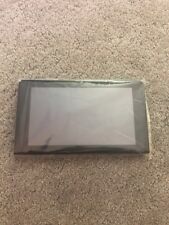 Nintendo Switch Console Tablet ** HOMEBREW READY ** New/Open Box ** CFW Ready!! 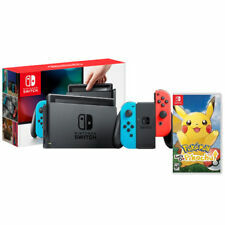 The Switch from Nintendo is a unique video game console that allows you to play games on a handheld console or on the TV. The device can easily switch from handheld to TV by just sliding it in and out of its holder. Nintendo and third-party developers are constantly coming out with new releases so that gamers are never bored. How does the Nintendo Switch work? Console: The tablet-like game system has a 6.2-inch LCD screen that supports multi-touch capacitive sensing, like a smartphone. The display has a slot for the games, a USB-C charging port, and a kickstand. Dock: The docking station connects the gaming system to a TV via an HDMI cable. Joy-Cons: Each game setup comes with two controls. These thin controllers can attach to a grip controller, the screen component, or by themselves. Accessories: There are a number of different accessories available to make your gameplay more fun, including the Pro Controller and steering wheel add-ons. What are the benefits of the Nintendo Switch console? 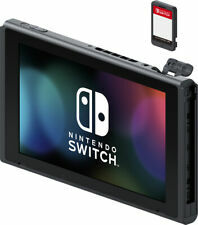 SD cards: The games are all loaded onto SD cards, allowing you to have physical game content that does not take up tons of room. Modes: This system can be enjoyed in three different ways, allowing you to game by yourself or with friends. Switching between modes is quick and easy. Parental controls: This app allows parents to allow for a maximum screen time or prevent them from watching certain videos. Add friends: You can accept friend requests so that you can all enjoy an online game together. What are some video games for the Switch? Mario games: Some Mario games are single-player. Others, like Mario Kart games, allow multiple players and are particularly fun at parties. Zelda - Breath of the Wild: Since its release, this open world game has been one of the most talked about games on any platform. Rhythm and puzzle games: Games like Thumper and Puyo Puyo Tetris are fun games that test your mind.